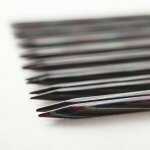 Foursquare needles take the same Knit Picks needles that you love and squares them. Smooth, flat sides fit perfectly against your fingers and gently rounded corners offer a comfortable, secure grip, helping keep your hands limber and your stitches even for hours of comfortable knitting. Boasting the usual strong and smooth layers of laminated birch, these Foursquare needles show off the deep purples, greens, blues, and distinctive black cord of the Majestic needle colorway. The burnished surface delivers just the right amount of grip to easily manage slippery yarns while warming quickly in your hands. 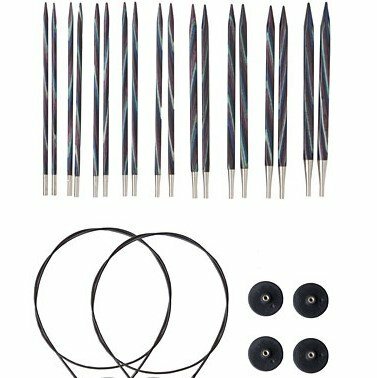 Featuring smooth joins, perfectly tapered tips and flexible cables, this set includes 9 needle tip sizes and 2 sizes of cables - all of which are stored in a handy vinyl case. Two small cable keys are included, which allow you to tighten your needle tips to the cables. Working on multiple projects that call for the same needle size? Use the included endcaps to safely store your project as you start the next.